Etisalat 1GB For N200 Night Plan, you might want to ask how legit is this, well am glad to announce to you that this is as legit as the network provider itself, usable in the night, for some times now it has been just Airtel Night plan, MTN night plan and of course Glo night plan but nothing from etisalat as regard this not until recently when they officially launched theirs. 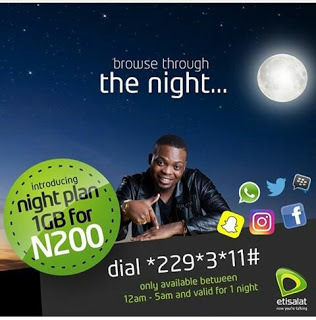 The etisalat night plan is a data bundle designed purposely for users who prefers a more cheaper plan, however the Etisalat 1GB For N200 Night Plan afford users the ability to access the internet at night, it works on any internet enabled device and can be used on any application to download, stream videos or browse the internet. Who Is Eligible for Etisalat Night Plan ? One very interesting thing about the etisalat Night Plan is that it works for both new and old users, as long as you are on any etisalat prepaid plan you definitely eligible for this service, similarly this plan works on all devices including Android, Java, blackberry 10 devices, Symbian phone and of course PC, as long as it is internet enabled. Another thing you need to take note about the etisalat 1GB For N200 Night Plan is that once activated, it only works between the hours of 12AM to 5AM (mid-night) and it is valid for just one night. which means, once subscribed, you only get a 5hrs use and must be same day you subscribe. .
am quite sure i don’t have to spell out the price to you again as we have been stressing on the price ever since, well in case you still want it repeated the etisalat nite plan cost just N200 and valid for a night. To Subscribe for the etisalat night plan, simply recharge your line with the said amount and dial *229*3*11#* and you will be welcomed to the plan. Sincerely this etisalat nite plan seems not to be interesting as its competitors, Airtel on the other hand offers its subscribers 1.5GB for just N25 while 500mb cost just N50 likewise mtn offers 500mb for N25 why then did they decide to go just 1gb for N200? ?